The TRUE definition of quality is reduction of variation about the mean. As quality experts note, unless you have data, you have no business talking about quality. The focus of Northwest Florida Spine is on improving care for back and neck patients. Northwest Florida Spine uses written protocols that emphasize a nonsurgical approach first, and surgery is held as the last resort. In the coming year, new patients coming into Northwest Florida Spine will complete an intake form that measures their pain level, severity of symptoms and functional status. Three months after their first visit, a nurse will call a random sample of these patients and interview them for functional status, current symptoms and patient satisfaction. This is the most unbiased, statistically relevant method for outcomes analysis. The clinical outcomes will then be analyzed by an outside firm that specializes in tracking spine outcomes, and is involved with other spine centers across the U.S. Quality is a journey, however, rather than a destination, and we are committed to continually improving. We will be posting severity data of new patients beginning in 2015 and a Clinical Outcome Report Card at the end of 2015. It’s important for the patient to understand that your choice of spine physician will determine the quality of healthcare you will receive. There have been many advances in the field of spine care over the past 10 years. But that does not mean every spine physician is using the most advanced approach. That’s because it takes a great commitment of time and training for a surgeon to learn to operate through instruments the width of a ballpoint pen and a one-inch incision. It’s much easier for a surgeon to simply make a three-inch open incision. But there is great benefit for the patient to have a one-inch incision. There is less blood loss and no need for donated blood. Because the incision is shorter, there is less disruption to muscles and ligaments so your recovery is much faster and less painful. Dr. Michael Rohan, Jr. is fellowship-trained in spine surgery, the highest level of medical education in the U.S. His fellowship was done at the prestigious Texas Back Institute, which in 1986 was the first and largest spine specialty center in the United States. During his fellowship, Dr. Rohan, Jr. specialized in minimally invasive spine surgery techniques that require the surgeon to operate through a one-inch incision using tubular retractors with tiny cameras and cutting devices in the tip. Dr. Rohan, Jr. founded Northwest Florida Spine 10 years ago, as one of the first spine surgeons to bring these new minimally invasive spine surgery and artificial disc replacement techniques to the Panama City region as a long-overdue alternative to traditional 3-inch long incisions that were common in the region. Consequently, Northwest Florida Spine over the years attracted hundreds of patients and referrals from across the Northwest Florida Panhandle region, from Mobile, Alabama; Fort Walton Beach; Pensacola; Destin; Miramar and to the east Tallahassee and Dothan, Georgia to the north. Responding to its regional reputation in spine care, in early 2018, the spine center transitioned its name from Northwest Florida Spine to Northwest Florida Spine which reflects the regional draw of patients. Currently, the spine specialty center is referred back and neck pain patients from across the Gulf Coast who can are looking for the most advanced minimally invasive spine surgery, motion preservation and artificial disc replacement surgery. 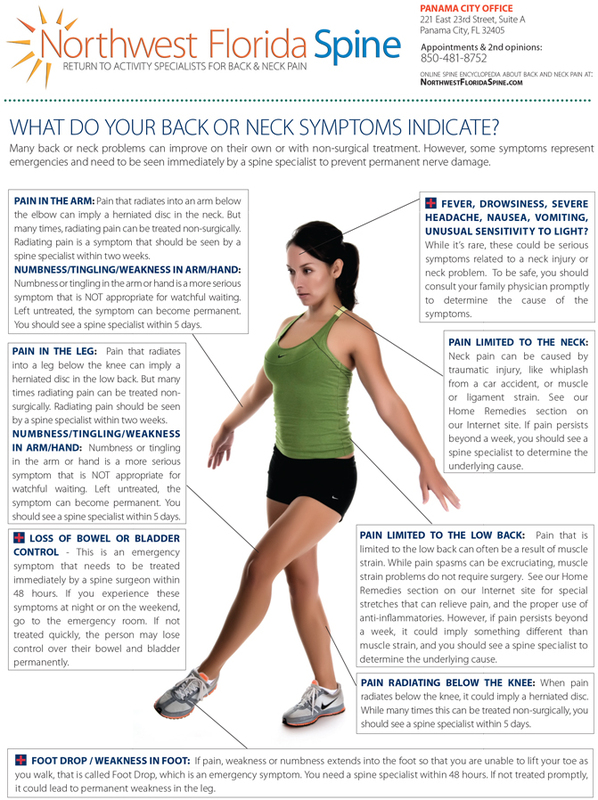 We recognize that those with back pain or neck pain often struggle to find a back doctor or spine center that can provide a second opinion for spine surgery and offer nonsurgical treatment for back pain, neck pain, scoliosis (curvature of the spine) and pain symptoms related to a herniated disc. We provide this content-rich informative Internet presence to help the person wth back pain gain a better understanding for the most advanced treatment alternatives for a herniated disc and other complex spine problems.